A Fish Eat Fish World! The rules of the game are simple, you must eat smaller fish and avoud being eaten by the larger ones which might seem easy, but during later evolutions there will be almost as many fish that are larger than you as there are fish that you can eat. 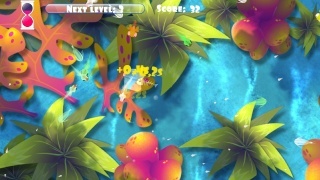 To counter this balance issue the game features many power-up's such as the bomb which kills all fish surrounding you and the shield which temporarily protects you from larger fish. There are many other power-ups to find in the game! 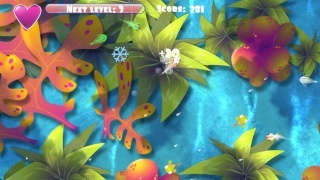 The game features 4 different fish to select, however you must reach evolution level 12 with the previous fish before unlocking the next one. Each fish has different stats which makes each fish a challenge to master! There are two single player modes which are Normal and Survival. In Normal Mode your score is what makes your fish evolve whereas Survival Mode is all about avoiding larger fish so you will evolve based on how long you have survived! You will still have to eat smaller fish in Survival Mode to add time to your hourglass, if time runs out you will lose. The party modes are extremely enjoyable, more than the single player modes. In party play you and up to four friends can compete or try to eat eachother in the ultimate test of survival. If it weren't for these multiplayer modes the game would feel quite shallow. The controls are silky smooth and very responsive on the Gamepad, however the Wii Remote and other control schemes for players 2-5 in party mode aren't as perfect. Some issues include delayed button relay among other issues, but these only occur once per every 2-3 games so it's not a game-breaking issue, but it's still a nuisance nonetheless. 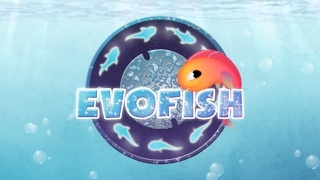 The visuals in Evofish look quite nice for a game that started its life on IOS, but the lack of variety such as every playable fish looking extremely similar to one another "especially during earlier evolutions" and having just one stage to play in this fight for survival really hurts the game's score on the visual side. The music on the other hand sounds very good with a tropical upbeat theme that plays during the game and many different arcade styled sound effects it sounds pretty good, however the lack of variety when it comes to the music does make the music become somewhat repetitive during lengthy play sessions, but overall it's not much of an issue! 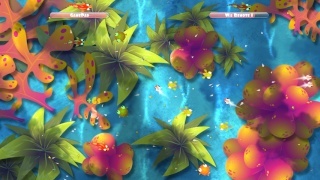 With terrific multiplayer modes, smooth controls "at least on the Gamepad", nice visuals, and superb music EvoFish is a good game for its price, however control issues with the Wii Remotes during multiplayer can make multiplayer frustrating at times, while the lack of variety in-terms of its visuals and audio does make the game somewhat repetitive, especially on the single player modes which aren't nearly as fun as the multiplayer modes. Overall this game is well worth $5 and we would recommend it if you have a few friends who are willing to play the game with you. Evofish looks pretty, but I don't think I'll bite! Yeah, this game just screams "I should be a Flash game!"